Slow down needs quick response. It’s council budget setting time and, whereas North Somerset is announcing an increase in council tax, B&NES has managed to freeze the ratepayer’s contribution, protect services to the public and continue to invest in jobs and homes. A trip to their website will give you the full details of how they seem to have done the impossible! Of interest to us here at the Virtual Museum is the news that funding remains in place for all eight library branches within the Authority’s area, and that entry to the Roman Baths, Fashion Museum and most exhibitions at the Victoria Art Gallery will remain free for all residents. The Victoria Art Gallery in Bath. Cllr David Bellotti – as the Cabinet Member of Bath and North East Somerset Council for Community Resources – is responsible for the budget. He told me that ‘our plan for the Victoria Art Gallery is to increase income and reduce the cost to the Council. That is a £50,000 reduction in the difference between income and costs this coming year. We will be working with the Friends (of the Gallery) and others to achieve this. It will become a work in progress with a target set.’ As far as the Larkhall loos are concerned he told the Virtual Museum that the Council has made it clear ‘ we will recognise the heritage of the current building and we will also look for alternative toilet provision in Larkhall. There is no reduction in the toilets budget in the coming year so that also will be a work in progress with a longer time-scale to meet the budget target.’ B&NES currently operate 29 public toilets and plan during 2014/15 to reduce this to 14 – keeping the ones in parks and play areas. ‘We will also be looking over the next year to identify alternative local provision where we are closing any. This could be in libraries, shops, council buildings, sports centres, etc,’ he said. The public toilets in Larkhall Square. In Larkhall’s case could we see B&NES offering an incentive to local cafes and pubs for people to use their loos? Or should the existing conveniences be converted into a privately run cafe with loos attached? If the heritage of the current building is ‘recognised’ that must mean B&NES do not intend to demolish it. Any other bright ideas? Bus stops on the move. The Council’s extensive and lengthy programme to improve pedestrian facilities on the High Street and north side of Bath Abbey continues to progress. The new temporary stops at the eastern end of the Abbey. Temporary bus stops have gone up near the east end of the church and facing towards Orange Grove. The old bus stops now covered as work starts in that area. The bus stops outside Starbucks – opposite the Guildhall – have been covered as the road drills are now operating in that area. There is also evidence of a new pedestrian controlled crossing which will operate from the east corner of the Abbey across towards the old Police Station. The new pedestrian controlled crossing being installed near Orange Grove. Shine a little light. B&NES is calling a temporary halt to the installation of new LED public lighting within the city’s conservation area to allow local people to have a say in how that street lighting appears. Guidelines on what any replacement street lights should look like, and the levels of light produced by them in the City of Bath Conversation Area, will then be drawn-up by the Council. Although the local authority already installs heritage columns and lanterns in some streets in order to uphold the qualities of the World Heritage Site, there is no guidance available to communities about what type of lighting they can expect in their street. Councillor Roger Symonds (Lib-Dem, Combe Down), Cabinet Member for Transport, said, “The Council receives regular feedback from residents living in the World Heritage Site about the design of street lighting and type of light being emitted. We want to make our approach to street lighting more consistent so that communities know to expect when a replacement takes place. “Guidance will be developing over the coming months and consultation will take place with local residents associations and heritage groups.” The announcement means that there will be a pause to the Council’s roll-out in the City of Bath Conservation Area of a district-wide project to reduce energy costs to the local taxpayer by replacing conventional street lights with state of the art LED technology. Councillor Symonds added, “We are making excellent progress on the progress of the LED lighting project that, when complete, will save the local taxpayer a substantial amount of money. The pause in the Conservation Area will allow the Council to consider a roll-out of softer light and lanterns which are more appropriate to the World Heritage Site.” Around £200,000 per year will be saved and the Council’s carbon emissions will reduce by nearly 800 tonnes per year – equivalent to 3% of the Council’s total carbon footprint. The vast majority of traffic route lanterns have already been replaced out of 4,000 following a successful trial at Hicks Gate, one of the first routes in the UK lit with this new technology. There are a total of 16,000 streetlights in the area. River Rescue Group set to run! Another step forward has been taken in the organisation of a body dedicated to reversing years of neglect along the banks of the River Avon. The inaugural meeting of the long-awaited river rescue group has taken place. PHOTO shows left to right (front): Bath and North East Somerset Council Cllr Dave Laming (Lambridge ward, Independent); Teal the Labrador; Cllr Sarah Bevan (Peasedown St John ward, Liberal Democrat); Philip Challinor, Denning Male Polisano Chartered Architects; (back row): Trevor Skoyles, lock keeper at Hanham; Cllr Bryan Chalker (Lambridge ward, Independent); Cllr Ben Stevens (Widcombe Ward, Liberal Democrat); Jeremy Douch, Regional Director, AECOM; Nikki Wood, Managing Director, Environmental Gain Ltd; Geoff Dunford; James Hurley, Director, Built4Life Ltd. The process by which Bath hopes to acquire the huge hoard of Roman silver coins discovered on a city-centre building site moves a step closer today with an announcement from the British Museum that the coins – having been separated and cleaned – are now being counted! The hoard had to be lifted by a crane as it weighed more than 100 kilos.© Cotswold Archaeology. Click on any of these images to bring them up to a larger size! Stephen Clews, the Manager of the Roman Baths and Pump Rooms told the Virtual Museum that ‘ this remarkable hoard of Roman coins was found in Beau Street in November 2007 in the course of archaeological excavations in advance of the conversion of the old Royal United Hospital building into a new spa hotel. ‘ According to the Roman Bath’s website http://www.romanbaths.co.uk/whats_on/beau_street_hoard.aspx the hoard was found in eight leather money bags and dates from 270 AD, a time of great upheaval when the western Roman empire was threatened by civil war and barbarian invasion. Thousands of coins are fused together in a large block, making identification and counting the exact number very difficult. A Beau Street hoard ‘collection box’ at the Roman Baths. With an indication of support already given by the Heritage Lottery Fund the Roman Baths has launched an appeal to raise £150,000 to acquire, conserve and display the hoard. It remains to be seen how accurate that amount will be once the actual valuation has been completed but, if everything goes to plan,the hoard should go on display in the Roman Baths museum in 2014. Pump Room? Not everyone’s cup of tea! It was a metaphor that was meant to raise a laugh – and it did. Stephen Bird of B&NES Heritage Services was explaining to members of the Mayor of Bath’s Corps of Honorary Guides why the Council had invested in a new cafe-restaurant facility on the opposite side of Abbey Churchyard to the historic Pump Rooms. The Guides were invited to take a look around the Roman Baths Kitchen – a fifty-fifty, million and a half pound investment between B&NES and Searcys the Caterers, to provide something a little less formal than the Pump Rooms Restaurant. The Mayor of Bath’s Corps of Honorary Guides gathering for the Kitchen tour! The Deputy Mayor, Cllr Dine Romero (centre) with Mayor’s Guide and event organiser Mrs Anne Twitchett on her right and committee member and rota organiser, John Cooper (left of picture). The complex is the latest transformation in the history of four back-to-back lodging houses which became shops and later a cafe. It’s a facility B&NES hope will be a money-spinner during the tourist season and somewhere for people to go before or after they tour the Roman Baths. I haven’t tried the food yet but the welcome from staff was warm and the views over Abbey Churchyard, and across to the Pump Room, very appealing. Great Flying Flues! Had myself a treat in being given a tour of the latest attraction now open to the public at No. 1a Royal Crescent. This is the latest addition to the premises owned by Bath Preservation Trust – an annexe to the main house which contains the newly-restored servants wing. The new ticket entrance for No 1 and No 1a Royal Crescent! You get the ‘wow factor’ the moment you step through the front door. It has a real mini-atrium feel to it as you look up towards a vast ‘flying’ chimney flue beneath a glass ceiling that floods the whole space with light. A sneak preview of the amazing ‘flying flue’ contained in the new atrium entrance to No1a. Only parts of the annexe will be ready for inspection but will include the entrance way, a debut exhibition in the new Brownsword Gallery, a well-stocked and Georgian-styled shop and a display about the restoration work which is still on-going. The exhibition is entitled ‘Home Truths: Georgian Living, Unlocked’ and showcases 18th Century objects which have played a part in shaping how we run our homes today. All are from the Museum Collection, and have been selected as ‘favourite items’ by members of staff and volunteers. Hidden moments in history changed the future for the rest of us. ‘Home Truths’ reveals some of those moments, such as gadgets designed to help servants in their work, alternatives to candles that were found when candle-tax was introduced, and the invention of ‘pest control’ in the kitchen. Unusual items include a very practical wig scratcher and travel-size nutmeg grater. The exhibition takes you on a journey through various aspects of home life, from the art of tea-drinking via the quirky and practical to the origin of many household items of today. No 1 Royal Crescent is re-united with 1a next door! The Brownsword Gallery is named after Bath businessman and philanthropist Andrew Brownsword, whose generosity has made the restoration and reconnection to this wing possible. Heritage Lottery funding has also to be matched by funds raised by the Trust which is always happy to hear from anyone who would like to donate. Builders everywhere as l passed through but plenty of evidence of attention to detail in all the restoration work. Within the new ‘shop’ parts of an original fireplace is still visible through glass behind the commercial shelving and below, where the kitchen will be, Georgian-styled ‘appliances’ will be installed in front of more contemporary kitchen-ware that can be used for practical demonstrations. Though a well in the scullery has had to be filled in it will still feature a hand-pump put under pressure so people can feel what it was like for a servant to pump up water into the house. Stairs into the cellars beneath are featured under glass and a whole wall has been cleared of plaster in the new atrium entrance-way to show original masons’ marks. The ‘Home Truths’ exhibition costs £2 per adult but is free to children under 16 and free to B&NES Discovery Card holders. Bath Preservation Trust’s “Georgian House” at Number 1 Royal Crescent. Fundraising to complete the restoration and refurbishment of the main museum building is still on-going. Work in the Georgian House at No 1 will not be completed until later in the year. I hear they are working towards a ‘soft opening’ of all the facilities in June and an official one a month later. The whole restoration and refurbishment will double the number of Georgian-styled rooms on view. Stand by for a whole new visitor experience too! I hear tickets – issued when you go into the newly-opened domestic wing – will be like a visiting card which you can then present to the uniformed ‘footman’ at the main door to No 1. A new theme will reflect a man who lived in the house for 20 years during the late Georgian period. Canal and railway targeted. Vandals are continuing to target the Great Western line through Sydney Gardens and graffiti daubs have now spread to the Kennet and Avon canal running through the park. Graffitit now daubed below Brunel’s last surviving iron bridge across the Great Western line. Graffiti now appearing on the canal bridges through Sydney Gardens. The people of Bath really must start acting as the eyes and ears of the City if these vandals are going to be caught and this daubing brought to an end. It is not sending out the right message to our visitors who come to admire a World Heritage city and some might say we are not taking enough pride in our own town either. A ‘marathon’ display of no loading signs! A close look at one of the no-parking signs in Great Pulteney Street. It is obviously a planning regulation but signs have gone up on every lamp-post in Great Pulteney Street giving more than a months notice of the loading ban to be enforced during the Half Marathon week-end in early March. Seems a great shame that such an ugly yellow blot on the Georgian landscape has to stay up for so long. Something else that will not entice our visitors to take photographs of this iconic street! Every lamp-post covered in yellow plastic signs! Maybe every other lamp-post would have eased the over-load of yellow plastic? Though l now here there is a reason for the blanket coverage. In the past people have taken the Authority to court over having their vehicles moved away and successfully argued that they did not see a sign. With one on every lamp-post that argument will not be so easily used to advantage. Can anyone think of a better way of dealing with this? POWER TO THE PEOPLE. Nearly two billion pounds is to be spent electrifying one of Britain’s oldest railways and you can be sure the sparks will be flying when those OLE’s (overhead power cables) reach the World Heritage city of Bath! Network Rail attended a meeting with B&NES at the Holburne Museum last week. The issue here is what effect the programme will have on Sydney Gardens and the passage of the railway through it. Brunel – the iconic Victorian engineer responsible for the Great Western line – deliberately planned the route through the pleasure gardens as a piece of theatre. This article goes into this in greater detail, but l have heard that one proposal mentioned to safeguard the newly electrified line, would be to lower the track so that people could still walk by the line but beside a higher wall with a pointed stone top so spectators will not be able to sit on it. I have not heard what other safety measures were discussed. The Great Western line passing through Sydney Gardens. Over the next three years Network Rail will be bringing about the biggest change in how the Great Western main line is operated since the track between Bristol and London was first laid down 176 years ago. In its day it was a three million pound Victorian investment in opening up trade routes and a pioneering scheme directed by one of Britain’s greatest engineers Isambard Kingdom Brunel. It’s now an historic line – peppered with heritage sites, museums and Grade 1and 2 listings – and even being considered overall for World Heritage status. Maybe he would have been the first to utilise overhead power lines – if such technology had been available to him – but Brunel is still regarded as a leading figure within an Heroic age of British engineering and on this rail enterprise was so hands-on he designed everything from bridges and railway stations to the teacups at Swindon station’s refreshment rooms. The bit of the line that matters most to Bath – and others keen to protect Brunel’s masterpiece – is the section of track passing through Sydney Gardens. This is a park – now owned and managed by Bath and North East Somerset Council – which once formed a 12 acre Georgian pleasure garden or Vauxhall attracting over four thousand people a day – including Jane Austen. It boasted supper boxes, a carriage ride, a labyrinth and bowling greens, a grotto, giant swings, music and fireworks. However, Britain’s growing prowess as an industrial nation was to impact on all the fun. Though the Kennet and Avon canal cutting across the gardens was seen as adding to the site’s appeal. The Kennet and Avon through Sydney Gardens. Thirty years later, in 1840, Isambard Kingdom Brunel believed his railway would enhance the gardens still further – although his broad-gauge line cut the pleasure grounds in two. How Brunel pictured people in Sydney Gardens admiring his railway. © Bath in Time – Bath Central Library Collection. Our exuberant engineer saw it as an opportunity to show off his achievements and make the railway a spectacular object of display. Walls were kept low and people could get really close. Brunel had even sketched the design for a pavilion to be built alongside where people could have a grandstand view of passing trains and maybe even take refreshments. According to Professor Angus Buchanan in his publication Brunel in Bath the engineer ‘ provided what was an almost theatrical presentation of the line, against an imposing masonry back-drop, with trains emerging from the wings in both directions and traversing the stage.’ Brunel, says the Professor, seems to have been successful in this objective as there appears to have been little public objection to his railway cutting across the gardens. But that was then and this is now. Temporary fencing beside the track. Setting the engineering work to come to one side for the moment, Network Rail have recently erected temporary fencing alongside the track through Sydney Gardens. There’s been much talk of increasing trespass on the line and of just how easy it is for someone to be killed. The fencing has subsequently acted a little like a ‘red rag to the bull’ in that one of the garden’s over bridges has been subjected to a bad graffiti attack – and vandalism that is now spreading elsewhere along the line. History and heritage seem to matter little to those armed with a spray can and a need to leave their mark. Network Rail spend three and a half million each year cleaning the stuff off around the country but the response is prioritized. I am afraid the fact the graffiti in Bath is visible to rail passengers and park users is third on the list after impacting safety and being offensive, racist or sexist. But in returning to the main matter in hand THAT vandalism might be seen to pale into insignificance compared to what Network Rail will have to do to ensure public safety – once the power cables are strung along the newly electrified line. I have been talking to Communications Officer Julian Burnell at Network Rail, and sounding out some of the difficulties that lie ahead. He told me the Company was engaged in implementing a much-needed upgrade and had been charged by the Government to carry out a set of requirements. ‘But we are very aware we are going through sensitive parts of the country. It is going to be quite a challenge,’ he said, ‘ probably the biggest change in how the line is run since it was first laid down. We are aware of our responsibility and proud to be custodians of an historic line.’ So aware, it seems, that Network Rail appointed heritage specialists Alan Baxter Associates to advise on sensitive design solutions for electrification. Options that would be discussed with English Heritage, local authorities and special interest groups as the project progresses. Alan Baxter’s Route Structures Gazetteer. Last year Alan Baxter prepared a Great Western Main Line Route Structures Gazetteer which, according to the English Heritage website, provides ‘ a baseline description and assessment of the significance of every railway structure and building along the lines affected by the Great Western Main Line Electrification Project.’ There is a companion volume which gives the history and significance of the Great Western main line in which over 650 buildings and structures have been assessed. When we get to the portion of the railway line cutting through Sydney Gardens Mr Baxter says, ‘The engineering of the Great Western Main Line through Sydney Gardens is a piece of deliberate railway theatre by Brunel without parallel. This utterly unique section of the line integrates line of route, landscape, retaining walls and bridges into a single engineering and design tour-de-force, in which every element responds to the picturesque Georgian planning of the Bath World Heritage Site…. It is of very high architectural and historic interest.’ Not only that but one of the foot bridges over the line in the park has extra significance. It turns out to be ‘the last remaining example of Brunel’s use of cast iron for bridges on the Great Western….. it has a surprising delicacy for a railway structure making it an exceptionally important GWR asset.’ There were once 22 cast iron bridges along the line. The bridge is Grade 2*, it is in a conservation area, in a registered park and garden and in a World Heritage site. It is also a favourite spot for late night male revellers to relieve themselves on to the track below. Try doing that with high voltage cables somewhere out there in the dark! Apart from the historic values of structures that have to be integrated into a pole and cable carrying electric system, it is the considerable extra risk to human life that has to be considered. Which is where l return to that rickety temporary fence that currently separates park users from the railway track. More of that temporary fencing! What will the permanent solution be to satisfy safety and aesthetics? Just how visible is Brunel and God’s Wonderful Railway going to be. According to the information l am hearing – not very! If they lower the track to a level considered safe – it certainly will not be so obvious. What of the view from the bridges that cross the line in the park. What screens will be necessary to protect those using or abusing them? Alan Baxter’s History of the Great Western line document explains how significant it was as a pioneering work and how lessons learnt ‘ in design, finance and operation, were of fundamental influence on the subsequent expansion of the railway system, at home and overseas…. its historic value makes it highly significant, not just in Britain, but internationally.’ Of the pioneering – pre 1841 railways – what distinguished the Great Western ‘were the extent of control exercised by one man, its chief engineer I.K.Brunel, and the character of the line which he designed.’ In terms of survival, ‘what is remarkable is that the Great Western Main Line starts and finishes at stations substantially or in part of the Brunel era, and at Bath, Swindon and Chippenham it has stations partly or wholly of his time.’ But what is Network Rail running here. An efficient transport system or a museum? Well a museum tends to be an enclosed space in which objects of interest are stored and displayed. To be more accurate we are talking about a 116 mile heritage trail. A transport system that has been passed down to us and one which will be continually modified to maintain its efficiency. As Julian Burnell of Network Rail reminded me. Those of us who have lived in the West Country all our lives will not have seen overhead lines on our railway. It is one of the last main rail routes to now make the change and it is going to be quite a shock. It will be making a major visual impact that cannot be hidden. An example of what can be done, says Julian, ‘with a degree of sensitivity’ is shown by the electrification of the Wharncliffe Viaduct – the first major structure designed by Brunel, to carry the Great Western line across the Brent Valley on the outskirts of London. The visual impact of the overhead electrification has been minimised by placing supports for the power cable on the alternate centre lines of the viaduct’s columns, thus maintaining symmetry of form. It’s a touch ironic to remember that Isambard was quick to take up and use any new invention that he thought would benefit his projects. The viaduct was to carry the world’s first commercial electric telegraph in 1839 and in wires against the sky line! The changes coming to our railway will be marketed in terms of the many benefits electrification will bring. Another two billion pounds will also be spent on a new fleet of trains to provide faster, longer and more frequent services for intercity journeys. A greener, cleaner, less noisy and more efficient rail network. ‘We have to find something that’s going to work for everybody,’ says Julian. There are going to be many at Monday’s meeting between Network Rail and B&NES council officials who will be keen to know more about how Bath’s section of the railway of spectacle – across viaducts and bridges and through Georgian parkland – is going to be changed forever. The Roman Baths. A ‘modern’ attraction? Are we going to find the ‘preservationists’ preparing for a ‘battle-royal’ or the resignation of compromise. Can the old live with the new? Isn’t that a constant ‘battle’ in this city anyway? Not all are so concerned about protecting history and heritage. There is much to be said about the sole concern of getting value for money as a rail passenger. In which case the coming of the power line is very welcome. Should we care so much about protecting – where we can – the remains of Brunel’s engineering triumph which brought a mechanical newcomer to the West. The hissing, shrieking locomotives that transformed travel and the face of Britain for ever. I can just imagine the cartoon that graces a page in The Times when emotions start to rise and Bath’s battle-lines are drawn. J.M.W.Turner’s wonderful 1844 painting entitled Rain, Steam and Speed – which most agree shows one of Brunel’s locomotives crossing the railway bridge at Maidenhead – will no doubt be featured with pylons and overhead lines superimposed upon it! It is something that will now happen for real – giving Bath a taste of what is to come. Julian says Network Rail have been pleased with the reception they have received from B&NES who are ‘keen to engage with the process.’ On this matter, l sit on the fence. Though not the one that will line the track through Sydney Gardens. I feel it may be too high to jump down from – and much too pointy!! So what do you all think. It is time to engage! Gangsters and gunslingers: a Hollywood ‘bite’ on the bullets of myth and legend. Real life and Hollywood legend get mixed together in a major new exhibition coming to Bath’s American Museum in March! Taking centre stage will be the two mythic moments in the history of the United States that shaped America’s national identity: the Wild West of the 1860’s to the late 1880’s and the wild years of Prohibition & Depression in the late 1920’s and early 1930’s. Gangsters and Gunslingers: The Good, the Bad and the Memorabilia will feature items relating to America’s Outlaw Heroes from the David Gainsborough Roberts Collection. It’s going to be an exciting ‘ride’ taking people from Custer’s Last Stand and the Gunfight at the O.K. Corral to the grisly end that met bank robbers Bonnie and Clyde and Depression-era outlaw John Dillinger AND there will be plenty to illustrate how Hollywood both commemorated and glamorised grim and violent realities transformed into myth and legend. Chief Gall – one of the commanders at the Battle of Little Big Horn. Historical artefacts and memorabilia to be displayed include Native American weapons confiscated in reprisal for the Battle of Little Big Horn – better known as Custer’s Last Stand. They include a war club belonging to Chief Gall – one of the tribal commanders whose wives and children had earlier been massacred by the U.S. Cavalry. There’s the medical bag owned by Doc Holliday- a survivor of the Gunfight at the O.K.Corral in Arizona back in 1881. It contains the tools of his dental trade and a photograph of his uncle. Moving on into the 1920’s/30’s there’s the watch worn by Clyde Barrow when he was gunned down with Bonnie Parker in 1934. Bank robbers and police killers – the pair became celebrity criminals and, of course, Hollywood material. You will be able to see one of the three death masks of John Dillinger with the exit wound of the bullet that killed him in a F.B.I. ambush clearly visible. Other exhibits will include silver cigarette cases presented by Frank ‘The Enforcer’ Nitti to his Chicago mobster boss, Al Capone, and by Bosie Douglas to his disgraced lover, Oscar Wilde. There will be guns worn by Wyatt Earp, Frank James and John Dillinger – whose stories were all given the Hollywood treatment. According to the American Museum, ‘Hollywood never let the facts get in the way of a good story. The silent film era rediscovered and refashioned the West in a potent new visual language. Many former cowboys became movie extras; other westerners drifted to Hollywood to become film consultants. One of these largely forgotten men was Wyatt Earp from the Gunfight at the O.K.Corral.’ Seems Earp would befriend the people who would later make him and his earlier brothers in arms immortal. The film makers who brought Earp cups of coffee on set so they could listen to the old man’s recollections of times past. ‘Together, these young men would go on to create some of the greatest visions of the West ever committed to film: the director John Ford and the actor John Wayne. Hollywood’s cowboy hero – John Wayne. In one of Wayne’s most memorable collaborations with John Ford, the 1962 movie The Man Who Shot Liberty Valance, a character observes: ‘When the legend becomes fact, print the legend.’ There has never been a better precis summing up how the history of the Wild West and the wild years of the Prohibition/Depression era has been represented and misrepresented in print and on film. Gangsters and Gunslingers – The Good, the Bad, and the Memorabilia, will be on view at the American Museum in Bath from March 23rd until November 3rd. It will be the second time the Museum will be able to showcase treasures from the comprehensive Americana collection and Hollywood archive of David Gainsborough Roberts. Based in Jersey, he partnered the Claverton Down sited Museum for its popular 2011 exhibition ‘Marilyn Hollywood Icon.’ ‘I am delighted, ‘ Gainsborough Roberts comments, ‘ that so wide a range of items in my collection can be placed on view in such a magnificent – and appropriate – setting as the American Museum. The Marilyn show was spectacular fun. I have never seen my collection better displayed. I have no doubt that Gangsters and Gunslingers will be as moving and memorable – especially for anyone, who like me, wanted to grow up to be a cowboy!’ A ‘glass’ act at the gas-works & getting Keynsham afloat again! I have a neighbour to thank for a whole new view of Bath which l was able to witness recently. We joined her on a dog walk around Bath Race Course at Lansdown. Then down and across farmland to Kelston Round Hill. Conditions were not perfect for long distance views in today’s grey and murky light but, gazing across Weston and towards the city centre, l was suddenly aware of a landmark as obvious in its impact on the skyline as the Abbey. It was not a good day for taking such a panoramic view but can you spot the old gasometer -towards the right side of this photograph? 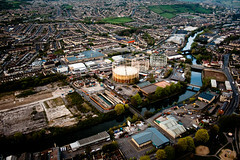 There in the distance was the last of the huge gasometers – once surrounded by the old gas works – now awaiting its demolition. I will be sad to see it go. A part of the city’s industrial past now not regarded as worthy of saving. Ugly, metal monstrosity. Unsightly reminder of the dust, smoke and smells now best forgotten but adjacent to the sanitized and preserved Georgian domestic architecture the tourists come to see. We don’t glory in our manufacturing history or boast of any employment other than that which served the people who were drawn here over the centuries by our thermal waters. The old gasometer could have been encased in glass. Turned into a conservatory and art centre. A museum or even a concert hall. Instead it will fall to make way for more ‘luxury’ contemporary housing. More blocks of concentrated living. Dividing the city peripheries into grid-like blocks is to me mind-numbing, boring and bland. l would rather look for differing shapes, flowing lines and real interactions between the past and the present, which also made room for elements of a different-lived industrial history. All linked by the beautiful and much over-looked river that flows through Bath. From Kelston Round Hill l also looked out towards Keynsham and the flooded fields around which the Avon loops. It is a town looking for a new future. Flooded fields beside the Keynsham loop of the River Avon. What if that rain sodden and flooded land-mass was actually maintained as a real lake and used as a marina? What a feature it might make. I am hoping to be able to tell you very soon about archaeological excavations that have been taking place near the town. This too could point towards a new way of invigorating a community having to learn to live without Somerdale. A town that can utitilise the very river – and its environs – many thought it had been sold down. Slow Zone for Safety Residents in Walcot, Lansdown, Larkhall and part of Lambridge have been getting leaflets through their doors explaining why the Council wants to create a 20 mph speed limit zone within these areas. It’s part of a programme to introduce such a limit on residential roads throughout Bath and North Somerset. The only exceptions would be the A4 London Road and Lansdown Road. Though it has to be said, for much of the day, you can go no faster along these routes. People are being asked for their views. B&NES says the limit will not involve the introduction of any physical calming measures such as speed humps and , with residential support and awareness, the limit would be self-enforcing. The consultation leaflet from B&NES. Benefits from trials carried out in Portsmouth, says the Authority, have shown that reducing the speed limit to 20 mph has a direct positive impact on road safety and the local environment. Prominent 20mph speed limit signs will be sited to show where the 20 mph speed limit begins. “20” roundel signs will be installed at regular intervals within the area affected. The area where the 20mph limit is proposed. Where l live, in the Larkhall area, there is already an urban and over-used road system clogged with parked cars. Many are left by people who then walk into the city for work. I felt sorry for the driver of a number 6 Larkhall bus trying to negotiate parked cars and on-coming traffic through Camden and down the hill into Larkhall. A speed limit of 20mph would certainly calm things down on St Saviour’s Road through Larkhall ‘village’ where – with parked cars and a very narrow pavement – pedestrians are at great risk. Getting cars off the road should be a major priority but slowing them down will also be good for the environment and may help to convince some to take the bus instead. Talking of buses, once more the regular 20 minute service into Bath from Larkhall is under threat. From my experience all age groups use these buses during the day and it is vital the current time-table is maintained. I urge anyone receiving a leaflet to make your views known. Hopefully you will agree that this is a measure aimed at protecting people and the historical environment. Will it be a welcome for that hillside? News that the National Trust may take over the management and maintenance of Bath’s picturesque Beechen Cliffs site is further evidence of the organisation’s influence in the city. To begin with over 18,000 people are card carrying members of the National Trust – the highest proportion of population anywhere in the country. Coupled with that, the National Trust’s landholdings in Bath already comprise almost ten per cent of the city. Beechen Cliff behind Southgate Street. It’s enabled a ‘green ring’ around the surrounding hills to be established and already the Trust’s ‘Skyline walk’ – six-miles of way-marked footpaths with outstanding views of the city – has proved to be one of Bath’s most popular attractions. It is the most downloaded walk of all on the NT’s national website. The proposal will now be looked at in great detail by the Trust – including ways of paying for land maintenance and consulting with local people. 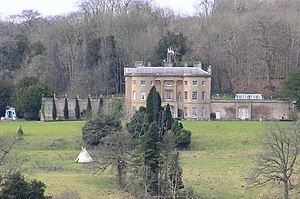 Wendy Stott, the Trust’s General Manager for Bath, said : ‘This is an exciting opportunity and important for the Trust because of the land’s position as a green backdrop to the views south from the city centre and its position close to land we own at the Bath Skyline and at Prior Park.’ Jane Austen described Beechen Cliff in Northanger Abbey as the ‘noble hill whose beautiful verdure and hanging coppice render it so striking an object from almost every opening in Bath.’ Its name was for many years assumed to refer to the now mature beech trees on its upper slopes, but recent research suggests it’s more likely to refer to a beach at the base of the cliff beside the river, before that was over-run by the development of the city. Says Wendy: ‘We know many people in Bath are keen for the National Trust to take on the management of Beechen Cliffs. With the 25th anniversary of Bath’s designation as a World Heritage Site, this is a a chance to highlight the qualities that make the city special and, if the details are right and we can raise the money, we would hope to be able to look after these special places forever, to further enhance the green setting of the historic city centre.’ Did you know Sir Roger Bannister used to run up the Cliff each day on his way to Beechen Cliff School, thereby developing the talent which led to the first four minute mile. Seeing the sights! Whatever the weather, if you are a visitor and want to take a look around the city, l suggest you do it in in the company of a volunteer member of the Mayor of Bath’s Corps of Honorary Guides. It’s a two hour walk around the major points of interest and costs nothing! Tours are given from outside the Pumps Rooms in the Abbey Churchyard at 10.30 am and 2pm Sunday to Friday. Saturday offers one tour at 10.30 am only. Me with a tour group in The Circus. The tours – which are highly rated on TripAdvisor – originated in the 1930’s. The earliest mention is in 1934 when Alderman Sturge-Cotterell showed visitors around Bath on Boxing Day and Easter morning. According to the Honorary Guides website – http://www.bathguides.org.uk – the service appears to have continued even during the period of the Second World War! Today there are more than 65 guides – me included – who turn out in all weathers and walk every day except Christmas Day. Out of place at Laura’s. Is it just me or do others agree that – after the Hilton Hotel – the fountain in Laura Place is the ugliest structure in the city of Bath. At least the Hilton is ‘fit’ for purpose – it is an hotel – but the fountain doesn’t even perform like a fountain should! MInd you l have been reading up on the history of this little 18th century quadrangle at the end of Pulteney Bridge. My thanks to Wikipedia – http://en.wikipedia.org – for telling me more about this space. Laura Place consists of four blocks of houses around an irregular quadrangle and was built by Thomas Baldwin and John Eveleigh between 1788 and 1794. The fountain in the middle was not part of the original plan and was added in the late 19th century. After Great Pulteney Strteet had been completed in 1877 local residents got together and successfully raised funds to build a grand column – a bit like Nelson’s Column in London. They had actually started work when they realised it would tower over their homes and promptly changed their minds. So the partially built structure was pulled down and replaced with a fountain. According to Michael Forsyth in the Pevsner Architectural Guide to Bath, although the central fountain basin is of 1877, the present fountain was added in 1977. Let’s have a competition – says me – to come up with something for the space that really adds to the architectural wonder of that whole stretch of late Georgian development! In addition to the trees in the Circus, other cotroversial foliage includes ivy on the north side of Queen Square, the bush in front of the Royal Crescent Hotel, and the vegetation that currently spoils the views from Beechen Cliff and Beacon Hill. Time for another Chainsaw Massacre? Thanks for that Nick. I understand the vegetation on one edge of the North facade of Queen Square is Virginia creeper. It has gone a lovely red at the moment, but some may wonder what it is doing to the stonework? It certainly hides architectural detail during the growing year. Richard, actually, it’s brilliant. I have enjoyed reading it immensely. Please keep it going. Best regards, Tony. Re. the Brunel plaque in Walcot Street (21 August), it’s a spoof. Brunel never lived there and the Pulteney Bridge reference is intended to deceive. So what happened to the piece on the Christmas lights? Seemed a valid point of view about what risks being a both tacky and premature event. Thanks for your comment Roger. Virtual Museum tries to be a daily blog with stories continually changing and being updated. I stand by my opinion regarding the small part Bath actually played in that One Show programme from the BBC but am moving on.